The Shinkansen is a network of high-speed railway lines in Japan operated by five Japan Railways Group companies. Starting with the Tōkaidō Shinkansen (515.4 km, 320.3 mi) in 1964, the network has expanded to currently consist of 2,764.6 km (1,717.8 mi) of lines with maximum speeds of 240–320 km/h (150–200 mph), 283.5 km (176.2 mi) of Mini-shinkansen lines with a maximum speed of 130 km/h (80 mph), and 10.3 km (6.4 mi) of spur lines with Shinkansen services. The network presently links most major cities on the islands of Honshu and Kyushu, and Hakodate on northern island of Hokkaido, with an extension to Sapporo under construction and scheduled to commence in March 2031. The nickname bullet train is sometimes used in English for these high-speed trains. 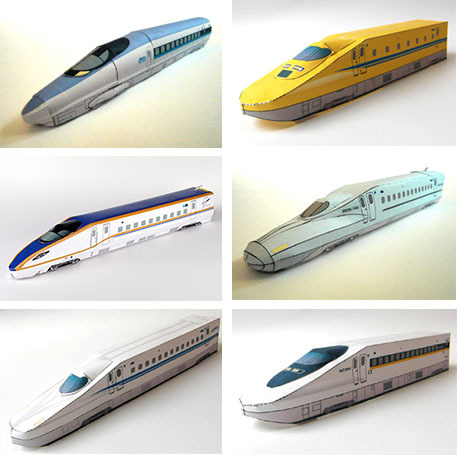 Paper models from JR West Japan website.